Leeann Atherton is a very good country singer, and Mike Stevenson is one of all those fine songwriters that Texas seems to be made of. 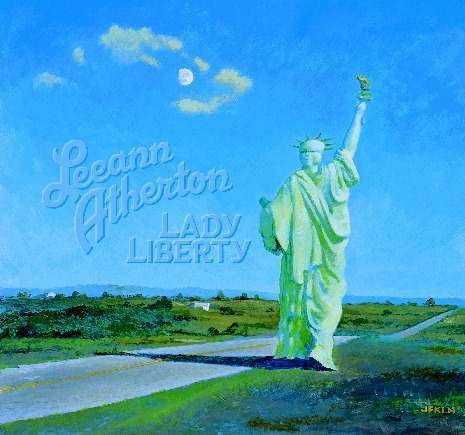 When Leeann sings Stevenson�s songs on Lady Liberty she reduces some of the country profile from her previous album Only Glory. The attitude is more integrative, the music more expansive, and the whole thing centers more on the songs. Mike Stevenson�s songs have a clear melodic focus. His lyrics give fine snapshots of life on the road and in Texan small towns, sometimes inserted in an elegiac meditation of American ideals (as in the title track). But the songs are also formed by Leeann Atherton�s strong personality. Sometimes she sounds like Maria McKee in her moments of artistic discipline, sometimes she gives a song a slightly naivistic folk touch, as in a duet with Toni Price. But most often we just hear Leeann Atherton�s a little husky, but at the same time totally sincere voice in it�s own right. Musicians like Scrappy Jud, Rich Brotherton, and Champ Hood gives her music and acoustic and emotionally congenial frame. 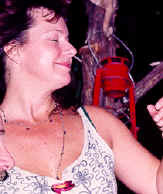 Austin based singer, Leeann Atherton teamed up with songwriter Mike Stevenson when he offered her a tape after a roadhouse show. Their first collaboration from last year, Lady Liberty, has taken the local Austin scene by storm, picking up assorted nominations and rave reviews from publications as diverse as the Austin Chronicle and the Belgian mag, RootsTown. Well, you can add Luke to that list now, because I believe Lady Liberty to be a super collection of songs delivered in a style that brings to mind Lucinda Williams, Kelly Willis and Maria McGee. Her duet with Toni Price on Drift On is a sublime highlight but is merely one of many as Stevenson proves himself to be a songwriter with a good feel for Texan roots country music and a knack for a memorable tune. It would be great to hear tracks like Disappear, High Livin' or Homers on the radio, though living in Leicester, I won't hold my breath. So Austin continues to amaze me with the wealth of musical talent living and working there. Twenty-five years ago, Atherton would be working on a major label, her soft, soulful voice gaining fans by good-ol' word-of-mouth. Like Bonnie Raitt's best early albums Atherton is comfortable singing country, blues, and well country-blues. Rich Brotherton, from Robert Earl Keen's band handle the production and the lead guitar. A kid from San Antonio named Mike Stevenson wrote all the songs and he's a killer songwriter who must either be awful humble or have a horrible voice. The tempos and arrangements are varied and make for a very enjoyable and easy-going CD. It's all here... search this one out. Lady Liberty promises to be one of the top Austin albums of 1999. Leeann Atherton's broad ranging voice frames of personal lyrics of songwriter Mike Stevenson on this album. It received rave reviews in Europe before it was even released in the U.S. Here's an example from Eddie Russell of Country Eastern West: "I love this CD. It will be airing on my shows. Leeann has a strong, smooth and distinctive voice and radio friendly production, well written songs by Michael and lots of variety ." Music that moves the feet and sings to the soul carries the day. Throw in lyrics that speak to the mind and celebrate life's little quirks, and you've got a CD worth listening to over and over. "Lady Liberty" combines Leeann Atherton's southern charm and the often brilliant songs of Michael Stevenson with guests from Austin's favorite Tuesday night hippie hour: soulful Toni Price, Champ Hood and his fiddlin' magic, and Scrappy Jud's foot-thumping electric guitar. "You got to leave it alone--let it be/It's just a two-headed monster/It's mean and it's ugly" from "Mean and Ugly" recognizes the sometimes-forgotten golden silence; "But those seesaw dreams that meant everything/Will come true and we'll smile as they do/And in that morning sun we won't have to run/We'll just ease on slowly drift along" of "Drift On" captures the low-key Texan spirit of lazy porch pickin' days and winding creeks. So take a break from everyday doldrums, smell the afternoon breeze and listen for Darcie Deaville's fiddle on "Homers High Livin"--"And this high livin'/I hope that it'll never end." In Texas, for a while, the �other� Leeann (let�s not quibble over the spelling here) was Lee Ann Womack, because THE Leeann was LeAnn Rimes. Now, the �other other� Leeann might be Leeann Atherton. While LeAnn has a great voice and great potential, and Lee Ann has delivered more fresh, memorable material, Leeann Atherton has refreshed the concept of singing other people�s songs. On her new album, Lady Liberty, one writer, Mike Stevenson, wrote all 13 cuts. The result is a strong album that forces serious music fans to reconsider which LeAnn is the �other� today. Okay, this isn�t supposed to be a competitive business, so let�s just consider Atherton�s new album -- the follow-up to 1995;s Only Glory -- on its own merits. �Disappear� is a slow, mature, bluesy vocal. �High Livin,�� despite the fiddle, sounds almost more pop than country, but also sounds real rather than manufactured. �Drift On� is a strong, lazy country duet with Toni Price. �Mean and Ugly� is a bouncy bit of laissez faire blues philosophy. �Real Life� is a poetic set of lyrics sung like Bonnie Raitt at her most soulful, with excellent instrumental accompaniment. �Hard Cold Cash� reminds me of fairly early Bonnie Bramlett. (Remember her? She used to be a cool blues singer and wound up as a Rodbell�s waitress on the Roseanne TV show.) �Smilin� Devil� is a strong mandolin-and-fiddle-driven lament about hopeless love. �Uncle Aubry� is a delightfully swingy, small-town lounging piece, complete with clarinet, about nothing or almost everything. �Gettin� Out� makes the blues sound like inevitable fun. �Homers� is pure Cajun country. �Never Thought� is just plain pretty and a little delicate. Taken as a whole, on its own merits, Lady Liberty is a prime example of how to make the most of living in an existential world. Stevenson�s writing is mostly no-nonsense, straightforward description that clicks well with Atherton�s voice and styles. Rich Brotherton produced and played. Stevenson added guitar and harmonica, and a host of Austin faithful including Dave Heath, Champ Hood, Darcie Deaville, and Scrappy Jud Newcomb. Every so often the humidity in Austin, Texas, Leeann Atherton's adopted hometown, hangs so heavy in the air that even a few minutes out-of-doors feels unbearably sultry. Then a storm breaks open the sky and rain flows like cosmic champagne, and when the sun comes out the next morning a magnificent breeze caresses the town, smelling like it just got in from the Atlantic coast. Something similar happens on "Only Glory",Leeann's new album on RainStorm Records. Like the singer herself, who came to Austin via Charleston and Nashville, "Only Glory" mixes steamy Southern flavors with a refreshing,unpretentious attitude. An upbeat country charmer like "Brand New Girl" (written as a wedding song) hails from a different sector of the musical map as "Benefit of the Doubt," a ballad Billie Holiday could have worn like a necklace. Yet they both feature a clarity of style that makes them timeless and modern at once, like a dusty old record by Patsy Cline or a shiny new one by Roseanne Cash. On others, Leeann sounds like she was tutored by Etta James. This seamless blend of country, soul, pop, and blues owes a lot to Leeann Atherton's background. Raised in Charleston, South Carolina, away from the seductions of shopping mall culture, she put herself through college singing in a dance band at a beach club. She studied the spirituals of the South Carolina islands, sat in with a rural black choir, and observed hardened professionals at work in the Nashville song factories. It was there during the early to mid-Eighties that Leeann learned songwriting and met a producer named Greg Humphrey. A business associate of Emmylou Harris' producer Brian Ahern, Humphrey showed her the ropes, studiowise, and introduced her to some of the best musicians in the business. A few of the songs they recorded together have ended up on this album. The rest were recorded more recently in Austin with acclaimed guitarist Rich Brotherton and Leeann's current musical partner, slide guitar virtuoso Johnny Mac. Listeners who knew none of this would swear that "Only Glory" all came together in a few short months like any other album. It's the consistent quality of the arranging and the writing - Leeann wrote or co-wrote every song - that disguises the decade of writing and recording that went into it (proving that day jobs are a drain on a person's time). "It's sort of my musical autobiography of those years," Leeann explains, adding that there are a lot more songs where these came from. Hometown audiences in Austin already know what new fans will soon discover. After years in the background, Leeann Atherton has hit her stride, her talent ready to take wing and fly. LEEANN ATHERTON "ONLY GLORY" Veteran Nashville tunesmith Atherton makes her disc debut with a Mattea-like anthem of love. Simple,appealing, folkie production with plenty of space around her vocal. discclaimer ROBERT K. OERMANN JULY 23, 1995 MUSIC CITY TEXAS Refugees, respectively, from Nashville and London, Atherton and I arrived in Austin about the same time in 1988 and I first saw her singing straight country with a full band at the Red River Saloon, was mightily impressed with her wonderful voice and expected some hot product toot sweet. Then she decided to have a family and disappeared from Austin stages,eventually resurfacing, in a low-key way, as a charming acoustic singer-songwriter. Though she doesn't include any dates, it's obvious from the credits, five sessions in four different studios with four different producers, that this is a patchwork, put together in bits and pieces over the years, Atherton herself the only common denominator on 11 tracks that range from the full production of When Love Comes Around, co-written with Riley Osbourn, who also produced and played organ, with John Inmon electric guitar, Johnny Mac slide guitar, Rich Brotherton acoustic guitar, Chris Maresh bass and Eddie Cantu drums to the barebones simplicity of Open Book and Benefit Of The Doubt, cut live with Johnny Mac. On the opening Brand New Girl , produced by Rich Brotherton, who also plays guitar and mandolin, with Eric Hokkanen fiddle, Dave Heath upright bass and Mark Patterson drums, Atherton glows with the emotional power, as writer and singer, of classic period Dolly Parton, but by the time she reaches the Spectorish Exceptional Man, she's demonstated that she can do pretty much anything she wants with her vocal power and control, best showcased on the soaring All For One, though her most effective song is the subdued, melancholy Just Like Us. It's been a bit of a wait but Atherton's finally come through, and in a big way.